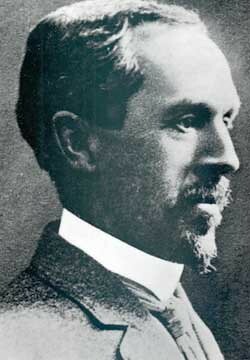 Henry Seely White was born May 20th, 1861 on the family farm in Cazenovia, NY. His father, Professor Aaron White, was a teacher of Mathematics and Surveying at Cazenovia Seminary, and later became the head of the Seminary. Though several generations of his family lived in Western New York, the Whites originally hailed from Connecticut, and Henry Seely White followed the family tradition in enrolling at Wesleyan University. There he excelled in Philosophy, Logic, Latin, Mathematics, Ethics, and Astronomy. He found a mentor in Professor Van Vleck of the Astronomy department, and after his graduation from the university in 1882, Van Vleck offered him a position as Assistant Professor of Astronomy and Physics at Wesleyan, which he filled for the 1882-3 school year. White then accepted a position as an instructor in Mathematics and Chemistry at Centenary College for the next year. He returned to Wesleyan in 1884 as Registrar and tutor, and during this time considered becoming a surveyor. He decided instead to pursue a career in Mathematics, and in 1887 departed for the University of Goettingen in Germany. At this time, many aspiring American Mathematicians did their graduate work abroad, especially in Germany. While there, he cultivated his interest in geometry and published many articles in German with his professors and other students. In 1890 he returned to the United States and married Mary Willard Gleason, a native of Connecticut who attended Wellesley to study music. For the next two years he was an assistant in Mathematics at Clark University, and then moved to Evanston, IL, after accepting a position as a professor at Northwestern University. In 1893-4, the World’s Fair was held in Chicago, and White served on the Committee for the Congress of Mathematics associated with the Fair. At Northwestern, he joined the American Mathematical Society and served on the editorial staff of its “Bulletin,” and also worked as the Editor for “Annals of Mathematics” from 1899-1906. In 1901 while on leave from Northwestern in Europe, he began writing what was to be his most famous work, a textbook on plane curves. In 1905, White left his position as Mathematics Department Chair at Northwestern and accepted a chairmanship in the Mathematics Department at Vassar College in order to be closer to his ailing mother. Unfortunately, she died the summer before he began his tenure. The Whites quickly adapted to life in Poughkeepsie. Henry White served as commodore of the Poughkeepsie Yacht Club, and for over a decade was the lecture agent of the Vassar Brothers Institute. The Whites and their three daughters attended the Poughkeepsie Reformed Church, and for many years Henry White was the superintendent of the Sunday School. Meanwhile, he was also holding important positions in the academic world. From 1906-8 he served as President of the American Mathematical Society, and edited its journal, “Transactions,” from 1907-1913. At Vassar, "Pop White" was beloved by students and faculty alike for his unique sense of wit and humor. Many students over the years helped with White's research and published alongside him. One of his top students, Grace Murray Hopper, went on to have a brilliant career in Mathematics and helped to found the field of computer science. Henry White attributed his interest in geometry both to his work at Wesleyan and Goettingen and to summers spent working on his grandfather’s farm. “This manual training was of value, strengthening my intuition of geometric forms in three-fold space,” he wrote in a memoir for the National Academy of Sciences. His specialized interests were in the fields of geometry of curves and surfaces, algebraic planes and twisted curves, homeomorphic sets of lines in a plane, the theory of invariants, and relativity in mechanics. Though he had started his work on plane curves in 1901, he really began in earnest on his sabbatical from Vassar in 1910. The resulting book, “Plane Curves of the Third Order,” was not published until 1925, but it immediately became a huge success as an authoritative work used in graduate programs for many decades afterwards. Mrs. White died in May 1933, and that same year Henry White was granted a retirement allowance by the Carnegie Foundation. He left Poughkeepsie and moved in with his daughter Mary Willard Perez and her family. He spent his retirement helping with the Perez’s apple orchard business, and died May 20th, 1943 from heart trouble.